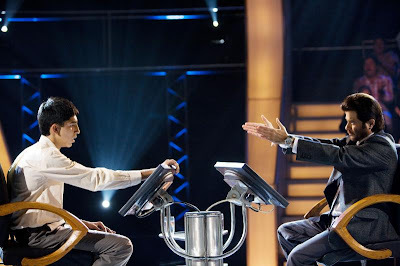 Danny Boyle's Slumdog Millionaire, this year's indie favorite, came out with quite the buzz from the festival circuit. In fact, as I write this, the National Board of Review has picked it as its Best Picture for 2008. So why was I so utterly underwhelmed when I saw it? Millionaire, the "rags to raja" story (as one film character puts it) of Jamal Malik (Dev Patel), and his rise from poverty to the hot seat on India's version of the game show, Who Wants to be a Millionaire?, is not without its charm. But where it all ends up is predictably hokey. It starts promising enough, with a primer on the slums of Mumbai and its persecuted Muslims as seen through the eyes of a young Jamal (Ayush Mahesh Khedekar) and his brother Salim (Azharuddin Mohammed Ismail). Their mother's murder leads them into forced panhandling for a Fagin-like captor named Maman (Ankur Vikal), and a fateful encounter with Latika (Rubiana Ali), a girl who Jamal falls for. The most thrilling parts of the movie take place in this, at once, familiar and exotic world where children are forced to hustle for adults' livelihood, and blinded as a reward since blind beggars bring in the most cash. But the conceit of the film lies in its framing device, an interrogation of the adult Jamal by the local police to determine if he got as far as he did on the game show by cheating. As the young man recounts how he knew the answers to each question, it first presents the moment on the game show when he is queried, followed up by a short vignette demonstrating one of Jamal's life lessons, and how it imparted knowledge of said answer. While the gimmick works initially, the plot device ultimately wears thin. Even great performances by Patel, and Freida Pinto as the adult Latika (indeed all the actors who portray the three principals at various ages), aren't enough to salvage the sense that this film is heading into the territory where contrivances rule. Out of character behavior, in the person of older brother Salim (now a thug for the local gangster), contributes to an all too predictable ending where we exonerate Jamal from his petty crimes because he did it all for love. Slumdog Millionaire is not a complete misfire. Why would it be, coming from Boyle, director of minor classics like Trainspotting and 28 Days Later? But it is a bit disappointing in its lack of originality. I was left longing for more of the local flavor prevalent in the flashback sequences, wishing I could skip the third act where its flaws became all too obvious. Slumdog Millionaire is in limited release. Still provided courtesy of Fox Searchlight Pictures. Agreed. The film is entertaining but utterly predictable and the third act comes off as really phony. The mash-up editing and awkward violent scenes don't display the same confidence Boyle has shown in his actors and stories in the past. The end credits dance sequence is incredible, but this is not nearly as strong as everyone says. I disagree heartily not with your review but with the general consensus that Danny Boyle is a great director. He's a courageous director, yes, in that he'll try anything. But that's his problem, too: he throws anything and everything at the screen, shamelessly, in the hope that something will stick. He's like the well-meaning baby brother at whom George Cukor and Billy Wilder would have affectionately rolled their eyes. Or a slightly more credible version of Ed Wood. At least in "Slumdog Millionaire" he's not working off an Alex Garland script. I can't for the life of me understand why Boyle can't recognize that Garland's scripts are character-free, ending-free, plotholed garbage-- and that, too, impacts on my respect for him as a director. He seems like a nice enough guy-- I've been fortunate enough to meet him-- but his catch-as-catch-can directing style puts me off. Great review. I wish I could have seen it that way. I saw it as a waste of a precious night of my life. This movie was horrible. This review is spot on. Slumdog starts out promising but that promise is bludgeoned to death by the contrived plot, underdeveloped characters, and terrible dialogue. The movie would have been much better if they stopped right after the part where the boys get to the Taj Mahal and begin giving tours.